SCOTT LEVY and RYAN YONTANZA are integrating new touchscreen displays, wireless mice and other state-of-the-art technologies at A.T. Still University’s Arizona School of Dentistry & Oral Health. An ever-increasing number of colleges and universities are creating innovative spaces to accommodate the changing dynamics of higher education. Many dentists would be envious of the dazzling technology that students at A.T. Still University's Arizona School of Dentistry & Oral Health (ATSU-ASDOH) in Mesa, Ariz., use as part of their educational training. In addition to sophisticated imaging machines, which many private dentists' offices lack, they have access to the latest PCs, wireless mice and keyboards, and touch-screen displays to review patient records. ATSU-ASDOH is among a growing number of colleges and universities creating innovative spaces to accommodate the changing dynamics of education. Institutions are designing classrooms with new technology, providing equipment to support online and blended learning, and building wireless infrastructures to connect the plethora of personal mobile devices on campus. When it comes to recruitment, students and faculty are taking notice. "I think technology is a big selling point," says Maureen Romer, associate dean of postdoctoral education and director of special care dentistry at ATSU-ASDOH. "Students don't want to sit in an antiquated classroom for eight hours a day. They want technology that allows them more flexibility." Cameras in the dental clinic's classroom allow instructors to record and enhance lectures. Instructors also use Microsoft PowerPoint slides, voice-overs and video to create interactive presentations that students can access online. The technology ensures that those who can't make it to class or want to revisit material later can access lessons at their convenience. The same technology also is contributing to the success of ATSU's blended course offerings as instructors use it to create web-based content. "Technology is a big draw for students," Romer says. The numbers support her claim: EDUCAUSE's 2013 Study of Undergraduate Students and Information Technology found that three-quarters of U.S. students believe technology helps them achieve their academic goals. Two-thirds of those surveyed say technology will better prepare them for the workforce. Students also reported bringing more devices to campus than ever before; however, they're using them independently rather than integrating them into their coursework because, they say, most faculty either discourage device use or ban devices outright. "It's a bit of a void and a real disconnect," says Eden Dahlstrom, the study's primary author and a senior research analyst at EDUCAUSE. Although students depend on technology, Dahlstrom says, they often lack guidance and encouragement to effectively use it within academics. The Center for Advanced Oral Health, meanwhile, houses ATSU-ASDOH's newest edition: the Advanced Care Clinic, a 10,959-square-foot, state-of-the-art oral healthcare facility that treats patients with highly complex medical or dental conditions, as well as patients with disabilities, whose general dental needs can be complicated or require a team of dental specialists. The center also is home to an orthodontic clinic, says Scott Levy, a university support specialist. Supervised by faculty members, third- and fourth-year ATSU-ASDOH students spend time training at the Advanced Care Clinic treating clinic patients alongside residents in the school's Advanced Education in General Dentistry program. The specialized training prepares the future dentists to provide treatment to patients with advanced oral healthcare needs. Each of the center's 15 dental chairs is equipped with a Lenovo PC, wireless mouse and Planar touch-screen display to create and review patient records. An intra-oral scanner and sophisticated imaging machines create 3D models and provide panoramic views of patients' mouths. "Technology should help students do what they need to learn and also prepare them for what they're going to see in the real world, so they can go straight out of learning and into practice without that technological barrier," says ATSU Desktop Software Analyst Ryan Yontanza. The IT team worked closely with dentists, deans and administrators to choose the technology. Bringing people with different perspectives and expertise together from the outset was critical to the project's success, Yontanza says. Instructors selected state-of-the-art dental equipment, while the IT team chose the most appropriate IT equipment. Innovative technology is particularly important in medical training programs such as dentistry because, when students graduate, they'll be exposed to electronic records, health information management systems and high-tech imaging tools, ATSU's Romer says. State-of-the-art equipment also makes learning more efficient because students aren't struggling with outdated technology. "All of our students are very technologically savvy," she says. "We do everything online and on the web. That's the way that they learned in college, so it's important to support that in graduate school." 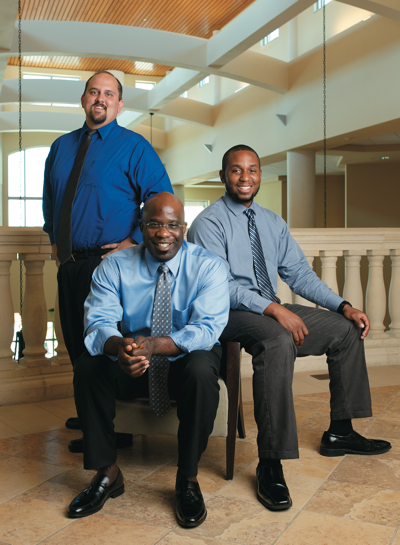 Dave Tatum, Robert D. Monroe and Matthew Elam were involved in the yearlong effort to develop the Classroom of the Future, now in place at Daytona State College. While ATSU-ASDOH's clinics outgrew their old space, officials at Florida's Daytona State College noticed that the school was outgrowing its old technology. Instructors could connect devices to classroom infrastructure, but were tethered to the front of the room. Students, meanwhile, brought tablets, smartphones and notebook computers of their own, but couldn't do much with them in class. Armed with ideas and recommendations from a series of discussions between faculty, administrators and IT staff in 2012, the college created the Classroom of the Future, a flexible, collaborative space filled with integrated wireless technology that is easily incorporated into curricula. The wireless piece was key, says Dave Tatum, IT resources coordinator. "Faculty didn't want to be tied down to a bunker at the front of the room," but instead wanted to be able to walk around the class and interact with students, he says. Instructors also wanted to use personal notebook computers, smartphones and tablets in class, and to let students use their own personal devices, regardless of the type or platform. All of the equipment in Daytona State's new classroom is wireless. Tatum's team installed two Cisco 802.11n load-balancing access points to ensure the system could accommodate school-owned and personal devices in the 35-seat classroom, which is equipped with an extreme-short-throw wireless Epson BrightLink 475Wi projector featuring an interactive whiteboard mode, a video camera that can record classes and charging stations with USB-based outlets. There's also a classroom microphone and six ceiling-mounted panels with two speakers apiece. "The sound quality is excellent in this room," says Robert D. Monroe, the college's IT resources manager. Enabling collaboration was important. Educators wanted groups of students to be able to connect to classroom resources, such as the projector, from wherever they were sitting. "It's not just a single, giant classroom with students working on their own," Tatum says. "It's breaking out into small groups, actually being able to use the technology." Completed in June 2013 and replicated in another room on campus this fall, the space also can serve as a recruiting tool to attract new students, along with the instructors needed to teach them. At the heart of it all is a 7-inch Crestron touch-screen display programmed to control everything from display sources to device power to lecture-capture functionality. The system is connected to the college's help desk and programmed to alert IT administrators when problems arise. Technicians can apply a fix remotely or dispatch a staff member to fix the problem onsite. A remote asset management system allows administrators to keep track of when and how often certain devices are used in the classroom, which Tatum says the college uses to plan future purchases and installations. "We can put all the technology in the room that we can, but if instructors don't use it, it's worthless," Monroe says. "If they go back to using chalkboards and let all this equipment collect dust, we really haven't succeeded." Although the Classroom of the Future is now used largely as a professional development proving ground for instructors, administrators say the goal is to train enough professors that the benefits of the technology, and demand for it, filter out across campus. "The idea was, 'Let's get some training in place. Let's get some volunteers who are really excited about the technology and let that grassroots movement go through the college,' " Tatum says. While it took a year to design and plan, it took only a day to install the technology, says Matthew Elam, Daytona State's data communications specialist, who led the installation. Administrators tested the equipment and spent about a week fine-tuning it. "We're still tweaking it now," Tatum says. As educators arrived back to school after the summer break, administrators were anxious for their feedback. "As far as we're concerned, we're not done yet." Thinking about enhancing technology so that it's a selling point for prospective students and faculty? Here's some advice from the IT team at Daytona State College in Daytona Beach, Fla.
Get faculty involved from the beginning and reach out across disciplines and departments. People with different perspectives and expertise will find innovative ways to use the technology. For instance, the projector in Daytona State's Classroom of the Future has Epson software that can display a pre-drawn musical staff. That way, the instructor can annotate onscreen what's happening in a piece of music as students listen. "That changes the game for the whole music class," says Data Communications Specialist Matthew Elam. Start by giving devices to a few forward thinkers willing to step out of their comfort zone. As educators use them and show their colleagues what they can do, others will ask for the same technology. "You put the demand in front, then work on the supply," IT Resources Manager Robert D. Monroe says. Build a device-agnostic infrastructure that accommodates all types of devices and platforms. It's difficult to predict the future of technology, especially when it comes to phones and tablets. "It's anybody's guess at this point what's going to happen in the next 18 months," IT Resources Coordinator Dave Tatum says.